Chateau / Country House1350 sq. ft.
Breathe the fresh country air…feel the crisp pond waters…hold hands while wandering the paths…and gaze at the wonderment of the stars through the pine trees. The short journey from St.Marys, Ontario’s stone town, will take you to your own oasis, away from everything. 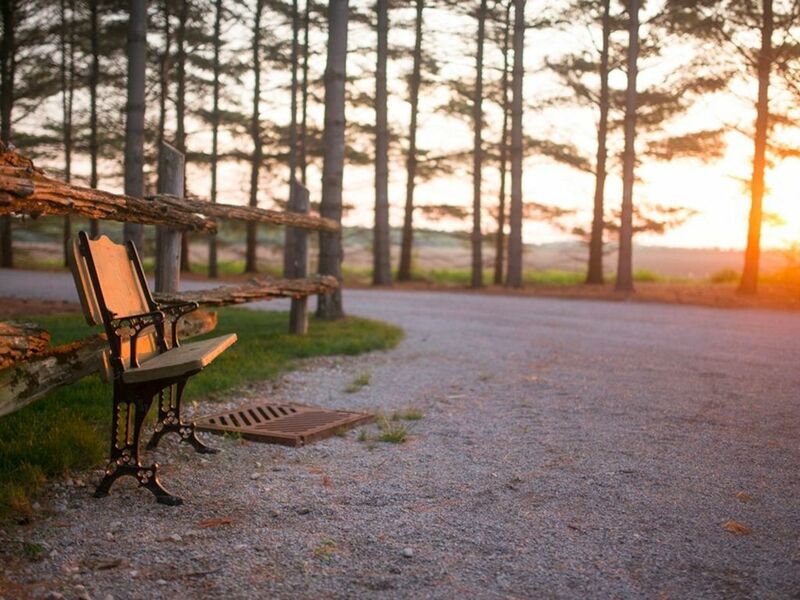 Whispering Pines Retreat is just 10 minutes from St.Marys, 20-30 minutes from London and 2 hours from Toronto. You may come in need of a connection to nature or just a break from everyday life. You will go home a different person, enriched from the experience of living among trees, away from the city. Whispering Pines Retreat operates on solar power. It is one of Canada’s larger off-grid establishments, 100% clean energy. Your biggest adjustment will be getting used to no noise. You will not hear the humming of electricity or the honking of car horns. Rather, you will be sung poetry by birds, hear the breeze whistling among the trees and be fully embraced by nature. You enter Whispering Pines Retreat by driving down a quaint lane surrounded by towering pine and black walnut trees. As you amble around the pond, you will come to your home away from home. The 1,350+ square foot second floor welcomes you with many of the comforts of home including a queen size bed, dining table, automatic coffee maker, comfy sofa and loveseat, pool table and so much more. It's your own personal bed and breakfast to relax and enjoy. The open concept makes it easy to view nature even while you are inside – from trees to a sprawling organic farm field, to the many birds that make Whispering Pines Retreat their home. Become reenergized and inspired with a stay at Whispering Pines Retreat. It's the getaway that will remain a part of you for life! Your comfort is our chief concern. Ample space, and no shortage of amenities await your stay. Whispering Pines is more than a cottage, it's your retreat! The white pine, spruce, cedar and black walnut trees were planted over 30 years ago on this 27 acre property. Originally, these trees were planted to be harvested. We are thankful that never occurred, so that we were able to build our home, enjoy the serenity of the property every day and able to call this retreat ‘home’. Whispering Pines Retreat can be found on a 27 acre bush lot, complete with fully grown white pine, spruce, cedar and black walnut trees. There are also oak, maple, cherry, elm and other tree species growing throughout the bush. In season, you can eat wild raspberries everywhere. The 12 foot deep pond can be enjoyed by all. It is a clean fresh water pond. You can sit on the deck, on the bench beside the pond or lounge on the beach. Feel free to relish the pond surroundings and the path that leads to the pond. At night, listen to the sounds of a few of nature’s wonders…the harmonious sound of frogs and crickets singing and talking. Please Note: Swim at your own risk! No lifeguard on duty! Parents are responsible for their children! Shower with hand rail and seat. Large towels, bath mat, hand towels, face cloths, shampoo, conditioner, shower gel, body cream, hand soap, hand cream, Q-tips, cotton balls, Kleenex and toilet paper are provided. Air conditioning is provided to keep you cool during those warmer days. Gas fireplace to keep you warm and cozy during those cooler days. There is a couch, a loveseat and reading chair. The kitchen is fully equipped with a fridge, gas stove, microwave, toaster, Keurig (including Keurig coffee & tea), kettle, plates, bowls, cutlery, glasses, mugs, wine glasses, mixing bowls, etc. An oval table with 6 chairs are provided, as well as, 2 kitchen island stools. The 12 foot deep pond can be enjoyed by all. It is a clean fresh water pond. You can sit on the deck, on the bench beside the pond or lounge on the beach. Feel free to relish the pond surroundings. Two girlfriends and I stayed in this amazing property for a Stratford Festival weekend getaway. From the first contact with Gail, to the follow-up after our stay, it couldn't have been any better. The guest house is incredible and the setting spectacular. We kept marvelling how Gail has already considered our every need. From the bath products, the available magazines, the fully equipped kitchen and bbq area, to the cute fairy details along the path in the bush, she made us feel special! The sunsets from the window and deck - WOW! Unfortunately the weather turned too cool to try the swimming pond but maybe we should have built a fire in the nearby fire-pit to encourage a dip? Of course there was lots of kindling and wood available. The proximity to the cute town of St. Mary's with so many shops and an easy drive to Stratford, make this the perfect spot for relaxation or adventure. A lot of superlatives - but honestly can't imagine how this retreat could be any better. HIGHLY recommend. Thank you very much for your wonderful words. We are delighted that you and your girlfriends were really pleased with your stay at the retreat. We aim to ensure that our guests enjoy their stay in a relaxing and serene space...time to rejuvenate and have some fun. We hope to see you again next year. We loved the place. The pond was a pleasant surprise and my daughter enjoyed swimming in it as well as looking for frogs. During the rainy day, we loved the billiard table in the loft. Thank you Eugene. We are happy to hear that you and your family enjoyed Whispering Pines Retreat. We had a wonderful time on your beautiful property! From lounging by the cool refreshing pond, to sitting by the campfire, listening to the sounds of the animals or going on a hike on the trail! It really is a great place to get away from the hustle and bustle of the city and relax in a beautiful setting. Highly recommended and we will definitely be back in the future! I was in need of an escape from the city to de-stress and I got what I needed. I went on my own as my husband was busy. I definitely want to go back with my husband for a romantic getaway. Thanks Carrie for your kind words and your tip about a blower dryer. It will be added to the list of provided amenities. Hope to see you and your husband in the future! We booked this place last minute because everything else was unavailable but it worked out really well! Super cute retreat. Lots of thoughtful touches, Gail and Andy have obviously put a lot of care into the place. The bed is comfortable and there are a lot of kitchen supplies, including coffee, a BBQ and firepit. It wasn't warm enough for us to go swimming in the pond but we enjoyed chilling in the hammocks. St. Mary's is a cute town for a day-visit, with lots of hobby shops, but I would also be happy holing up at the property all weekend and enjoying nature. A great romantic or solo retreat and I would definitely book it again! Thank you Danielle for your kind words. We greatly appreciate it. Glad that it was exactly what you were looking for. Thank you Cindy and Paul for the kind words. It was a pleasure meeting the both of you. We are pleased to hear that Whispering Pines Retreat was exactly what the both of you were looking for.